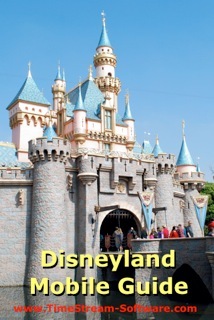 When it comes to the Disneyland Mobile Guide by TimeStream Software, what really sets it apart in my opinion is the incredible photography that you will find in the app. There are some really intricate shots there, ones that the photographer had to coax Disney into allowing him to get, and they are interspersed throughout the app. In this post, I thought I would share with you some of my favorites, and allow you to see them for yourself! 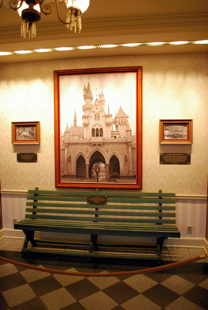 In so many ways, the park bench above is the reason that Disneyland — and later on Walt Disney World — existed in the first place. 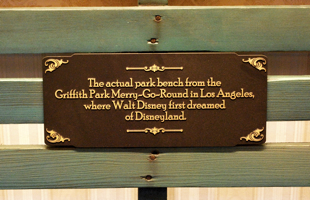 This park bench is from Griffith Park, and was the park bench where Walt Disney would sit while his girls rode the Merry-Go-Round and wondered why there wasn’t a park where the parents could have fun with the kids, instead of waiting for them. It was then that the dream that would become Disneyland took root. 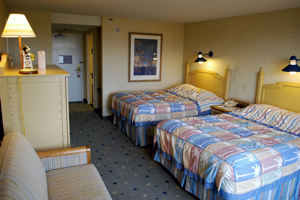 The next picture I wish to share with you isn’t a snazzy one — but it could certainly serve you well if you are travelling across the country — or even the world — and wanted to get an idea of what kind of accommodations you have waiting for you. It’s pictures like this one that help you get the idea that the Disneyland Mobile Guide isn’t just for when you are in the Park — it’s also a useful Disney Planning Tool! 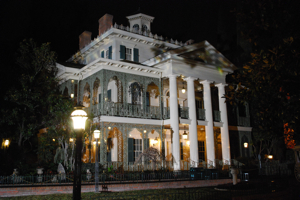 One of the greatest attractions at any of the Disney parks, in my opinion, is The Haunted Mansion. What I find incredible is how different the buildings at Walt Disney World and Disneyland look from one another! I can’t wait until I’m able to take in The Haunted Mansion in Disneyland for myself! The Haunted Mansion, located in the New Orleans Square part of Disneyland. 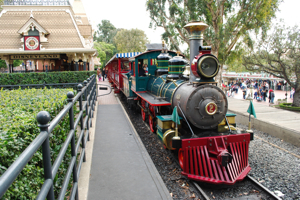 The last picture I wish to share with you is of the Disneyland Railroad. Why a simple picture of a train, you ask? Well, if you look closely at the photo, you’ll see that there is a little gate that is open, and that the train tracks are to the photographer’s right. This section of the train is normally off limits, but TimeStream was able to get permission to take this shot of the train where Guests are not normally allowed to go. It’s this level of detail that sets Disneyland Mobile Guide apart from other Disney apps in my opinion! You can enter using the Rafflecopter code below, so why not do so now? Good luck everyone that has entered already!